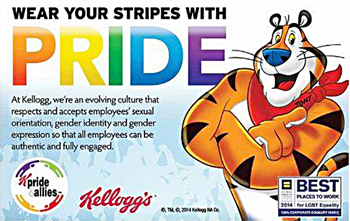 The ever crazy right-wing extremist American Family Association hate group is going cuckoo for Cocoa Puffs over the fact that Kellogg’s took out an ad in last month’s Atlanta Pride magazine featuring Tony the Tiger. Kellogg’s was a sponsor of the Atlanta Gay Pride March and festival last month. Apparently, Tony the Tiger wants to make sure you and your kids “wear your stripes with pride,” gay pride that is. Worst of all, though, the “PRIDE” ad didn’t even get the pun right. Tigers don’t belong in “prides,” let alone pride parades. Between Kellogg’s, Apple and Disney, what are good Christian parents supposed to tell their children about why they can’t have cereal, an iPhone or ever go to Disneyland. Best News EVER! Especially with how some voting went down in some recent elections. I’ll be sure to buy only Kellogg’s…at least until the others get onboard!